Lock in a great price for Holiday Inn Club Vacations at Desert Club Resort – rated 8.9 by recent guests! The pictures did the room no justice The villa looked way than expected. It was clean and very spacious. We all loved it. It's not too far from the strip, we were able to walk the short distance. Overall the room and facilities were great. I would definitely recommend staying here. The apartments are clean and beds very comfortable. Very close to the strip. We love that the pool is open late. Great place for families. Friendly staff let us check in early, facilities were awesome, enjoyed restaurant, everything very comfortable and convenient. Used and appreciated shuttle to strip. Thanks! Express check out, cleanliness and space was great!!! I’d stay here again. Secluded area off the strip. 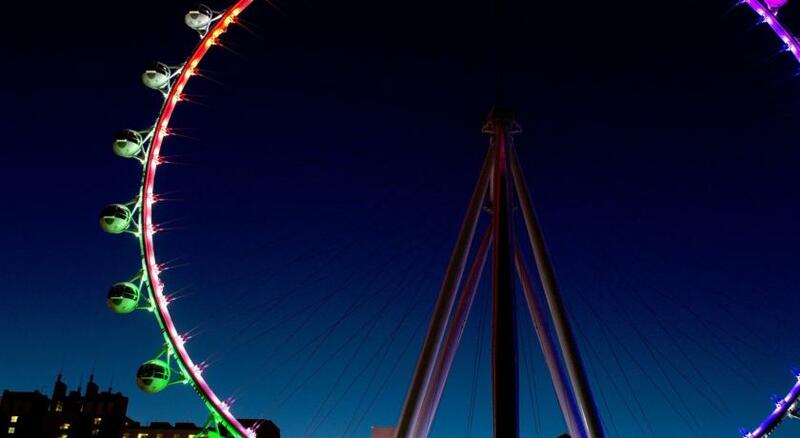 And easy walking access to the strip Linq area. Love the shuttle bus and what destination it offers. Free parking. I liked the whole set up. It was really cozy and grear for a family experience with small children l.
The third room was great. Finally ADA access to ADA room. Holiday Inn Club Vacations at Desert Club Resort This rating is a reflection of how the property compares to the industry standard when it comes to price, facilities and services available. It's based on a self-evaluation by the property. Use this rating to help choose your stay! One of our top picks in Las Vegas.Featuring 5 heated swimming pools, miniature golf and a game room, this all-suite resort offers a free shuttle to the Las Vegas Strip. A poolside restaurant is available. A full kitchen is included in each suite. A fireplace and a flat-screen TV are featured in each suite at Holiday Inn Club Vacations at Desert Club Resort. A washer and tumble dryer are included. Free Wi-Fi is included. Two fully-equipped fitness centers and 5 hot tubs are available at Las Vegas at Desert Club Resort Holiday Inn Club Vacations. A concierge desk can assist guests with dinner reservations or show tickets. Offering all-day dining, Gold Mine Bar and Grill serves specialty cocktails throughout the day. BBQ facilities are available. Las Vegas McCarran International Airport is 10 minutes’ drive from the resort. Cesar’s Palace is less than 1.5 miles away. When would you like to stay at Holiday Inn Club Vacations at Desert Club Resort? A full kitchen and seating area with a fireplace and a flat-screen cable TV with pay options is featured in this suite. A balcony or a patio is provided. Please note: If a breakfast-included rate is booked, it is only for a maximum of 2 guests. Breakfast for any additional guests will incur a surcharge. This suite features a separate living room with a flat-screen cable TV with pay options and a fireplace. A full kitchen and 2 bathrooms are provided. A full kitchen and seating area with a fireplace and a flat-screen cable TV with pay options are featured in this suite. A separate dining area and a balcony or patio is included. Featuring a patio and a balcony, this air-conditioned room provides a fireplace, cable TV with a DVD player, a seating area and free toiletries in the private bathroom. Offering a fully equipped kitchen, this signature room has a flat-screen cable satellite TV with premium channels, a balcony and a sofa. Guest bathrobes and slippers are provided. Hotel surroundings – This neighborhood is a great choice for travelers interested in shopping, city walks and nightlife – Check location Great location - show map Guests loved walking around the neighborhood! House Rules Holiday Inn Club Vacations at Desert Club Resort takes special requests – add in the next step! A USD115 damage deposit is required on arrival. This deposit will be fully refunded at check-out, as long as there isn't any damage to the property. Holiday Inn Club Vacations at Desert Club Resort accepts these cards and reserves the right to temporarily hold an amount prior to arrival. Offsite construction projects near the resort may at times cause intermittent noise and light pollution, as well as impact traffic on both sides of the resort. Breakfast included rates are for a maximum of 2 guests per night booked. Any additional guests will be charged separately. Guest must provide a valid credit card upon check-in. A security deposit will be placed on hold for the duration of the stay. RV parking is not allowed at this hotel. The sofa bed in featured rooms is a queen bed. There is only 1 elevator in the main building. A security deposit will be charged upon arrival and refunded upon check out pending possible charges and damages. Please note, construction on all parking areas will begin November 15th, 2018. During this time, certain areas will be closed off and you may experience periodic construction noise during this project. A damage deposit of USD 115 is required on arrival. This will be collected by credit card. You should be reimbursed on check-out. Your deposit will be refunded in full by credit card, subject to an inspection of the property. Fighting and screaming in the parking lot every night we were there and nobody seemed to stop it. Should be more security at night. The door didn’t shut properly and we had to slam it every time. Our key wouldn’t work at the pool and I wasn’t walking to the front reception in my bathing suit. Couldn’t walk to strip with the kids but the free shuttle service was great and there is always Uber. We did decide it was nice to be in a location not so close to the strip. I liked how each little complex of villas had a pool and that as busy as it was, it did not feel crowded. Great family atmosphere. This is a good value resort within easy reach of all the strips shows and attractions. The poolside cafe served good breakfasts and the concierge was helpful in getting discounted show tickets. The apartments were spacious and had everything you could need. The construction works over the road start early if you are a light sleeper take earplugs. The restaurant staff at breakfast were so slow and would probably opt to eat elsewhere if stayed again. Read the t&c when you include breakfast in your stay as it only includes for 2 people not entire party. The apartment was a great size for a family of 5 (3 teens) it was clean on arrival and gave us all plenty of space and privacy. The checkin took almost an hour. The booking for two apartments of two bedrooms villas was prepared for months that more than long enough for arranging the connecting or as close as possible, this turned out to be separate in to another building. The paid coupon for breakfast was merely a $9.99 discount for a cheapest available menu instead of a real use for a breakfast, even worst was two rooms apartment only given coupon for two persons instead of 4.
the room, the floorpan, the fireplace. Friendly staff,spacious rooms as shown on pictures and excellent location very close to the strip. The upstairs shower was very loud when turned on. Great location for central Las Vegas and walking to Las Vegas Blvd. Suite was very comfortable for our family of six. Had stayed here a couple of years before & chose to stay here when we returned.